On June 24, Yad L'Isha -- Max Morrison Legal Aid Center and Hotline hosted a party to mark the happy endings of 12 stories that never should have begun. Four years after the Center opened its doors, 12 agunot - women whose husbands refused to grant them Jewish divorces - gathered to describe how their lives had changed since meeting the toanot (rabbinical court advocates) at the Center who represented them in the rabbinical courts and aided them in finally securing their get. "Dvora Brisk, the toenet (rabbinical court advocate) who represented me is my angel of redemption," said Mira Aharonbiev, who bears the scars of beatings and cigarette burns inflicted by her husband. "She treated me with respect, calmed me, and helped me believe in myself. As she saved my life, she lifted the heaviness in my heart and the darkness around me." Brisk and other staff members of the Caroline and Joseph S. Gruss Tel Aviv Regional Center, who offer legal aid gratis, are available around the clock to provide support and advice for their clients who are living the nightmare of being agunot. "I was an agunah for 17 years," Mira told the gathering. "My husband ran away to Russia and the rabbinical court claimed they couldn't find him. My attorney took thousands of shekels from me and did absolutely nothing on my behalf. I have three children who have gone hungry most of their lives." Newly-freed Esther Maimon (r) shares her joy with toenet Sara Markowitz. Brisk explained how the get was finally secured. "I located Mira's file at the court and had it pushed to the top of the roster. With the help of a rabbinical colleague in Russia, we hired a private investigator who located Mira's husband and discovered that he was on his way to America. I then contacted a bet din (rabbinical court) in the U.S. that tracked him down and had him arrested for refusing to grant the divorce. A year after Mira first came to us, she received her get. Now we are helping her find employment and rebuild her life." Until the Center opened in 1997, fewer than five men had been ordered by the bet din to grant their wives divorces, noted lawyer Susan Weiss, who directs the Max Morrison Center and its telephone hotline. Since then a revolutionary change has been set into motion. "Today more than 250 divorces have been ordered by batei din, and eight men have been imprisoned for refusing to grant a get," announced Rabbi Eli Ben Dahan, secretary of the Jerusalem bet din, who works closely with the toanot. "It is an honor to be partner with the Center in a process that is one of the greatest in Eretz Yisrael," he told the gathering. 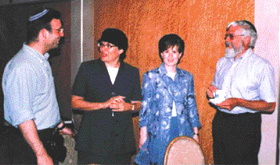 Celebrating happy endings: (l-r) David Roth, Susan Weiss, Dvora Brisk and David Morrison. The assembled guests, including OTS chancellor Rabbi Shlomo Riskin and David Morrison, who established the Center in memory of his father, shared the happiness of Esther Maimon, who arrived directly from receiving her get. Esther, who had waited and suffered for nearly eight years, arrived with her parents and sons, all of whom were crying with joy. The tears proved to be contagious as Esther told her story. "It was hell, but now it's over, it's really over," she said, as she embraced advocate Sara Markowitz. "I finally have my life back." "We needed to move Esther's file to a different city in order to expedite her case, because the first court was completely unresponsive to her situation," recalled Markowitz. "One of the rabbinical judges went so far as to claim that they couldn't help Esther because she couldn't prove that it was her husband who beat her and not someone else!" All of the newly-freed women had waited at least four years for their cases to be resolved, Weiss noted, thanking Rabbi Riskin, the bet din and the women's groups who work closely with the Center, along with the donors whose support helps provide hope in seemingly-hopeless situations. "One of the women here with us today received her get after 17 years, and another after 21 years," she revealed. "Fortunately, the Legal Aid Center has been able to expand, with the Gruss Regional Center in Tel Aviv and another center in Safed. The hiring of an additional two advocates, with the support of The Nash Family Foundation, enables us to reach out to even more women. "The problem of agunot is heartbreaking," Weiss concluded. "For each woman who is freed, there are many more who are still in chains. Our goal is to continue to work tirelessly on behalf of these women for as long as the problem continues to exist."